Changes Create New Supplier Opportunities The Department of Defense has requested $311.6 billion in new budget authority for the fiscal year (FY 1987) beginning October 1, 1986. Included in the budget request, biggest ever in U.S. peacetime history, is $11 billion allocated for construction of 21 ships and conversion of three others. The budget also requests $25.7 billion for the Navy's "O&M" account (operations and maintenance, often referred to as the "readiness" account). Of that total, $1.1 billion is allocated for "ship maintenance and modernization" of the Navy's strategic submarine forces (Polaris, Poseidon, and Trident ballistic missile submarines, or SSBNs); another $5.3 billion is set aside for ship maintenance and modernization of the Navy's general purpose ships— the battleships, cruisers, frigates, destroyers, attack submarines, and other combatants and support ships that would do the bulk of the fight- ing in a "conventional" (non-nuclear) as opposed to a "strategic" (nuclear) conflict. Projection tables, trend statistics, and other supporting data provided Congress by Secretary of Defense Caspar Weinberger in his February 5 "Annual Report to the Congress" also show the following: • The Department of Defense's five-year defense plan (FYDP) projects additional increases in the budget authority that will be re- quested in each of the next four fiscal years. The overall five-year plan will take the DOD budget from the $311.6 billion requested for FY 1987 to $332.4 billion in FY 1988 to an eventual $395.5 billion in FY 1991. (It will, that is, if Congress approves the annual DOD requests in toto, and no one in official Washington believes that will happen.) • The Navy's five-year shipbuilding program will continue on track at about the same pace—20 or so new-construction ships funded each year, and four or five major conversions. There seems to be a reasonable chance that most of that program will be funded, although some specific line items could be delayed or stretched out over a longer time frame. Some others could be accelerated, though. • The O&M readiness account will also be maintained at about the same level, and in fact will probably be increased somewhat. 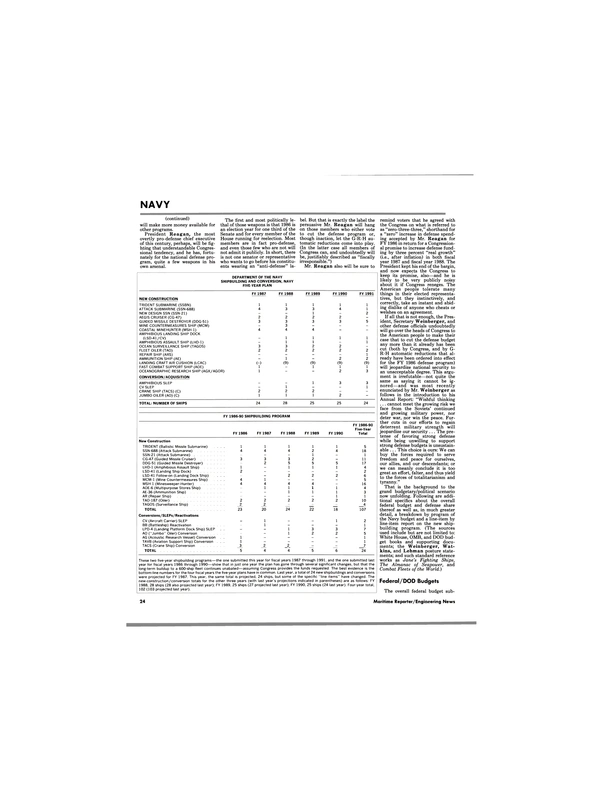 The official projections on this have not been released (the five-year defense plan and five-year shipbuilding plan are required by law to be submitted to Congress), but the Weinberger report and the "posture" statements submitted by Navy Secretary John F. Lehman Jr. and Chief of Naval Operations Adm. James D. Watkins all say much the same thing: ships now operational will be kept in service longer; there will be greater emphasis on maintaining ships and aircraft now in the active inventory at a higher degree of readiness than there will be on new procurement; and more and better equipment will be turned over to the Naval Reserve, and that equipment also will be maintained at a higher degree of readiness. All of that translates into more rather than less O&M funding. For the U.S. shipbuilding and shipbuilding support industries the new budget comes as a welcome relief. There have been dire predictions emanating from Capitol Hill that the so-called Gramm-Rudman- Hollings budget-balancing legislation passed late last year would, among many other things, decimate the defense national program in general and create particular havoc with the procurement accounts. House Armed Services Committee Chairman Les Aspin (D-Wis.), for example, has said that "G-R-H," as it is now being referred to, would force a $40-billion reduction in DOD outlays in fiscal years 1986 and 1987 alone, and an $80-billion cutback in budget authority for the same two years. (Outlays represent the money actually spent in any specific fiscal year. Budget authority represents the money appropriated by Congress in a specific fiscal year and authorized for expenditure; the money authorized and appropriated does not, however, have to be spent in the same fiscal year in which it is appropriated. Funds appropriated, for example, for shipbuilding programs, which require considerable leadtime, typically are not spent until perhaps four or five years later.) The as-yet unknown impact of G-R-H has thrown all previous budgetary calculations into at least temporary turmoil, however. Named after its three principal sponsors— Republican Senators Phil Gramm of Texas and Warren B. Rudman of New Hampshire, and Democratic Senator Ernest F. (Fritz) Hollings of South Carolina—G-R-H was signed into law in mid-December by President Reagan as The Balanced Budget and Emergency Deficit Control Act of 1985 (Public Law 99-177). The laudable purpose of G-R-H is to force the executive and legislative branches of government to do what they so far have seemed unwilling or unable to do voluntarily: balance the budget. G-R-H does this by setting predetermined but increasingly lower "target deficits"—$171.9 billion for FY 1986; $144 billion for FY 1987; $108 billion for FY 1988, etc. The goal is to reach a zero deficit by FY 1991, and to help Congress and the White House reach cooperative agreement each year there is a provision included in G-R-H that requires mandatory reductions (half from defense, half from domestic programs) if a budget that does not exceed the target deficit is not agreed to by a predetermined date. The "date certain" for the FY 1987 budget is August 20 of this year. That means that Congress must pass, and the President must sign, a G-R-H budget by that date or the automatic reductions go into effect, and the defense-decimating effect predicted by Chairman Aspin will become reality. Complicating the situation further is that a court challenge to G-R-H submitted by several members of Congress has been upheld by a lower federal court and now is headed for the Supreme Court. The lower court held that Congress cannot abdicate to such non-elected officials as the director of the Congressional Budget Office (CBO) and the director of the Office of Management and Budget (OMB)—who jointly determine whether the target deficit mandated by G-R-H will be met—the authority given by the Constitution to Congress only to raise revenues and appropriate and distribute federal funds. Until the Supreme Court rules (probably not until sometime this summer, most observers agree) on the appeal to the lower court's ruling, though, the executive and legislative branches are bound by the provisions of G-R-H, and must make their plans accordingly. The stage therefore is set for what Sea Power Magazine, an official publication of the Navy League of the United States, already has suggested very likely will be "the legislative donnybrook of the decade, and perhaps of the century." The real problem, of course, is that—no matter what the Supreme Court rules—the White House has for years been asking for, and the Congress has been approving, expenditures which so greatly exceed revenues that the cumulative public debt is now more than $2 trillion, and getting ever larger every year. Even if the G-R-H target deficits are met the national debt will be an estimated $2.6 trillion or so by FY 1991, with annual interest payments alone costing perhaps 10 percent of that, or $260 billion. All of that means that, with or without G-R-H, Congress and the White House face many long years of budgetary belt-tightening, so it can be assumed that the budget battles are just now beginning. It also can be assumed that every member of Congress will fight tooth and nail to defend the projects and programs of most concern to his or her own constituents, and that many will be quite willing to cut back on spending for national defense if doing so will make more money available for other programs. President Reagan, the most overtly pro-defense chief executive of this century, perhaps, will be fighting that understandable Congressional tendency, and he has, fortunately for the national defense program, quite a few weapons in his own arsenal. The first and most politically lethal of those weapons is that 1986 is an election year for one third of the Senate and for every member of the House running for reelection. Most members are in fact pro-defense, and even those few who are not will not admit it publicly. In short, there is not one senator or representative who wants to go before his constituents wearing an "anti-defense" la label. But that is exactly the label the persuasive Mr. Reagan will hang on those members who either vote to cut the defense program or, though inaction, let the G-R-H automatic reductions come into play. (In the latter case all members of Congress can, and undoubtedly will be, justifiably described as "fiscally irresponsible.") Mr. Reagan also will be sure to remind voters that he agreed with the Congress on what is referred to as "zero-three-three," shorthand for a "zero" increase in defense spending accepted by Mr. Reagan for FY 1986 in return for a Congressional promise to increase defense funding by three percent "real growth" (i.e., after inflation) in both fiscal year 1987 and fiscal year 1988. The President kept his end of the bargin, and now expects the Congress to keep its promise, also—and he is likely to be very publicly noisy about it if Congress reneges. The American people tolerate many things in their elected representatives, but they instinctively, and correctly, take an instant and abiding dislike of anyone who cheats or welshes on an agreement. If all that is not enough, the President, Secretary Weinberger, and other defense officials undoubtedly will go over the heads of Congress to the American people to make their case that to cut the defense budget any more than it already has been cut (both by Congress, and by GR- H automatic reductions that already have been ordered into effect for the FY 1986 defense program) will jeopardize national security to an unacceptable degree. This argument is irrefutable—not quite the same as saying it cannot be ignored— and was most recently enunciated by Mr. Weinberger as follows in the introduction to his Annual Report: "Wishful thinking . . . cannot meet the growing risk we face from the Soviets' continued and growing military power, nor deter war, nor win the peace. Further cuts in our efforts to regain deterrent military strength will jeopardize our security . . . The pretense of favoring strong defense while being unwilling to support strong defense budgets is unsustainable . . . This choice is ours: We can buy the forces required to serve freedom and peace for ourselves, our allies, and our descendants; or we can meanly conclude it is too great an effort, falter, and thus yield to the forces of totalitarianism and tyranny." That is the background to the grand budgetary/political scenario now unfolding. Following are additional specifics about the overall federal budget and defense share thereof as well as, in much greater detail, a breakdown by program of the Navy budget and a line-item by line-item report on the new shipbuilding program. (The sources used include but are not limited to: White House, OMB, and DOD budget books and supporting documents; the Weinberger, Watkins, and Lehman posture statements; and such standard reference works as Jane's Fighting Ships, The Almanac of Seapower, and Combat Fleets of the World.) Federal/DOD Budgets The overall federal budget sub- mitted by President Reagan calls for $850.4 billion in receipts, projects $994 billion in outlays, and allows for a deficit of $143.6 billion— a scant $400 million below the G-R-H target deficit of $144 billion. (The outyear budgets, for FYs 1988- 91, also meet the G-R-H targets, or fall close enough to preclude a triggering of the automatic reductions.) Because the gross national product is expected to grow at an average rate of between 3.5 percent and 4.0 percent annually over the next five years, federal revenues will increase enough, administration officials say, to pay for both the requested increase in defense programs and the higher annual servicing of the national debt. Most non-defense programs will be maintained at about their current (FY 1986) levels, but a number will be cut back substantially, others will be eliminated completely, and still others transferred in whole or in part to the custody of state and local governments, with "private-sector" funding also counted on to pick up part of the tab for welfare and other "entitlement" programs. Thus, although the most damaging effects of G-R-H can be avoided— "and will be," Mr. Weinberger says, "if Congress acts responsibly"— there will be a major reordering of national priorities, if the President has his way. And, no matter what the final outcome, there seems no way to avoid a long, bitter, and bloody budget fight this year, not only between the President and Congress, but within Congress itself as the several liberal and conservative warring factions joust and tilt with one another over which programs to save, which ones to terminate, and which ones to restructure. The internal strife within DOD is just as vigorous, but less apparent, because it takes place behind closed doors and the numerous issues in dispute have been at least temporarily reconciled by the time the official DOD budget is submitted to Congress. That budget this year is, as always, sliced, dissected, and distributed several ways, among them the following: —By Expenditure "Purpose," a catchall term which includes: (a) $142.7 billion in investment funding (for procurement of tangible "things" ranging from beans, bullets, and black oil to electronics and communications systems and subsystems of all types to such major "platforms" as ships, aircraft, and tanks); (b) $43.2 billion to pay for "operations" (training exercises, flight hours, and steaming hours); and (c) $125.7 billion for military pay and such "related" items as PCS (permanent change of station) payments and food and subsistence allowances. —By "Title"—which allocates the same $311.6 billion as follows: for military personnel (not quite the same, note, as the "pay and related" category just referred to above), $76.8 billion; for O&M, $86.4 billion; for procurment, $95.8 billion; for research, development, test, and evaluation—the "RDT&E" that defines and refines the ships, aircraft, and weapons systems that will be funded in future procurement budgets—$ 42.0 billion; military construction, $6.8 billion; family housing, $3.4 billion; and "other," $0.5 billion. —By "Military Function"— Army, $81.5 billion; Navy and Marine Corps, $104.5 billion; Air Force, $105.2 billion; the Defense Agencies, $19.5 billion; and "Defensewide" programs, $0.9 billion. Navy/Shipbuilding Budgets The overall Navy/Marine Corps budget also is sliced several different ways, but the most meaningful categories, for budgetary purposes, are as follows (FY 1986 appropriations are included, for comparison purposes, in parentheses): military personnel, $17.5 billion ($15.9 billion); Naval Reserve personnel, $1.5 billion ($1.3 billion); Navy O&M, $25.7 billion ($24.5 billion); Naval Reserve O&M, $975.9 million ($895.0 million); naval aircraft procurement, $11.3 billion ($11.2 billion); naval weapons procurement, $6.1 billion ($5.2 billion); naval shipbuilding and conversion, $11.0 billion ($10.8 billion); "other procurement, Navy," $6.5 billion ($6.4 billion); Navy RDT&E, $10.6 billion ($10.1 billion); naval military construction, $1.8 billion ($1.7 billion); and Navy and Marine Corps family housing, $784.3 million ($665.1 million). The important O&M account includes— in addition to the $1.1 billion and $5.3 billion allocated, respectively, to the ship maintenance and modernization of the Navy's strategic forces and general purpose forces—an additional $631.3 million for "airlift and sealift" and $6.9 billion for "central supply and maintenance." Included in the latter account is $2.2 billion for "ship and weapon system maintenance and engineering," and various other large sums for other maintenance programs, some of them undoubtedly requiring at least the partial support of the shipbuilding industrial bflSG Two O&M footnotes: (1) The Administration requested—in the numerous "whereases," codicils, and special provisions that often provide the most interesting reading in the DOD authorization and appropria- tions bills—that $3.4 billion of the O&M total be made available "for the performance of such work in Navy shipyards"; Congress provided $3.65 billion for the work allocated to Navy shipyards in the FY 1986 Defense Appropriations Act. (2) The Administration is seeking elimination of a Congressionally mandated provision that requires that "a test program" be initiated to determine the "direct and indirect costs" of the overhaul and maintenance work conducted by Navy shipyards as compared to the same work done by private-sector shipyards; the latter have been saying, usually through the Shipbuilders Council of America, that the repair and maintenance of the Navy's ships can be done both more cheaply and more effectively by private yards. There also are several special provisions included in the shipbuilding appropriations account of particular interest to the shipbuilding community as well as certain other factors germane to an understanding of the current and projected program. Among those special provisions of law and "other factors": (a) The Navy wants to take more time to make up its mind on contract awards, and has for that reason asked that the money appropriated in FY 1987 "remain available for obligation until September 30, 1993." Congress set a cut-off date of September 30,1990 for obligation of funds appropriated for FY 1986; the Navy is in effect, therefore, asking that its decision time be increased from five to seven years, (b) The proposed Appropriations Act includes language stipulating that "none of the funds herein provided . . . shall be expended in foreign shipyards for the construction of major components of the hull or superstructure" of the ships funded by the Act, and that "none of the funds provided . . . shall be used for the construction of any naval vessel in foreign shipyards." The spectre of G-R-H has combined with numerous DOD management initiatives— multi-year contracting, increased use of competition at all contract levels, and "second sourcing" (the distribution of prime contracts to more than one supplier)— to expand the defense industrial base and create business opportunities for numerous companies never previously considered for DOD work. The escalating pressure to cut costs, without sacrificing quality, means that prime contractors are now shaving their own contract bids to the bone, and are in turn seeking lower prices from their own suppliers and subcontractors and/or turning to other sources to satisfy their requirements. Within that context, the following is a breakdown, not necessarily in order of importance, of the newconstruction ships and conversions requested and/or projected for funding in the Navy's FY 1987 and FY 1988 programs. Ship descrip- tions and missions are taken from DOD budget backup books; FY 1987 and FY 1988 funding details are taken from DOD and Navy budget tables: AGOR Oceanographic Research Ship—$34.0 million, including $1 million for contract design, is requested for FY 1987 funding. The AGOR is "a new class of oceanographic research vessel capable of operating worldwide in all seasons," and "suitable for use by Navy laboratories, contractors, and academic institutions" for "a broad spectrum of oceanographic requirements." (The Navy also uses the designation "AGX" for this ship.) AO (Jumbo) Auxiliary Oiler—$ 64.1 million, including $1.8 million for contract design, is requested in FY 1987 for conversion of one ship; a second will be funded in FY 1988 at an estimated cost of $49.5 million. Both conversions are part of a long-range program to convert or "jumboize" five existing fleet oilers to increase their cargo capacity. AOE Fast Combat Support Ship—$620.2 million, including $0.8 million for contract design and $6.7 million for RDT&E, is requested for construction of "a twinscrew, 26-knot sustained speed, gasturbine geared-drive . . . ship 755 feet in overall length, 107 feet in beam, and a draft of 39 feet, with a total of 660 accommodations." C G - 4 7 Aegis Cruiser— $2,066.9 million (including $50.9 million for outfitting, $42 million for post-delivery requirements, $0.8 million for contract design, $38.4 million for RDT&E, and $10.5 million for associated military construction) is requested for two ships in FY 1987; two more ships will be requested in FY 1988, at a cost now estimated at $1,902.6 million. The Ticonderoga-class CG-47 Aegis guided missile cruiser "employs the proven hull and gas turbine propulsion system of the [DD-963] Spruance-class [destroyer]." Its guns, missiles, "and other advanced systems, augmented by passive protection features," make it "a most heavily armed and survivable cruiser." Carrier Service-Life Extension Program (CV SLEP)— $109.4 million, including $13.3 million for outfitting and $12.6 million for contract design, is requested for FY 1987; an additional $544.8 million will be requested in FY 1988 for the SLEP of one Forrestal-class aircraft carrier, with the work to be carried out at the Philadelphia Naval Shipyard. The SLEPs are intended to extend the service life of carriers now in the active inventory "from a nominal 30 years to 45 years." D D G - 5 1 Arleigh Burke- Class Aegis Guided Missile Destroyer—$2,646.4 million, including $10.9 million for contract design and $107.7 for RDT&E, is requested (for three ships) in FY 1987, with another $2,354.6 million planned to be requested next year for construction of another three ships. Perhaps the most eagerly awaited ship in the Navy's new-construction program (because of the long-term contract opportunities provided), the DDG-51 will be 466 feet long and displace 8,200 tons. "It will be armed with a Vertical Launching System accommodating 90 missiles .. . [and] will carry a 5"/54 rapid-fire gun" and other new state-of-the art weapons and electronic systems. The contract for the lead DDG-51 was awarded in FY 1985 to Bath Iron Works. "The FY 1987 program will be awarded competitively." LHD-1 Amphibious Assault Ship—$236.1 million, including $3.6 million for outfitting and $0.5 million for contract design, is requested in FY 1987, with another $1,046.9 million projected for FY 1988 funding (for one ship). The LHD-1 is "a twin-screw, 22-knot multipurpose amphibious assault ship, 820 feet in overall length, 106- foot beam, with accommodations for 2,802 personnel, including troops." Ingalls Shipbuilding is building the lead ship under and FY 1984 contract. "Follow ships for FY 1986, 1988, and 1989 will be competed on a three-ship multi-year basis." LCAC Landing Craft Air Cushion—Only $11.8 million, including $0.5 million for RDT&E, is requested in FY 1987 funding, but an additional $221.3-million request, for nine LCACs, is projected for FY 1988. An air-cushion vehicle 87 feet 11 inches long and 47 feet wide, the LCAC is designed to operate "over both water and land. It can be carried in the well deck of present and future amphibious ships. It has a payload capability of 120,000 pounds, and can operate at 40 knots with this load. Range capability is 200 nautical miles." LPD-4-Class Service Life Extension Program—$31.5 million, including $8.4 million for contract design, is requested in FY 1987; another $97.8 million will be requested in FY 1988. The LPDSLEP, like the CV-SLEP, is designed to extend the life of ships now in the inventory—in this case, the Austin-class amphibious trans- port docks—"by 10 to 15 years" and to give them the capability "to carry two LCACs and four CH-46 helicopters" or equivalents. The first LPD-4 SLEP is scheduled to begin in FY 1989. LSD-41/CV Landing Ship Dock Cargo Variant—No funds are requested in FY 1987, but $311.2 million will be request in FY 1988 for the first of four ships projected for future funding (down from six ships projected last year). The FY 1987 budget request does include $21.1 million in follow-on funding to finish LSD-41s previously approved and now under construction at Lockheed Shipbuilding, Seattle, and Avondale Shipyards, New Orleans. The LSD-41s are twin-screw, diesel-propelled amphibious assault ships, 609 feet in overall length, 84 feet at the beam, with 917 accommodations. The "cargo variant" version "will have essentially the same hull and engineering plant. . . [but] will carry more cargo in exchange for fewer LCAC spaces." Construction of the first ship is expected to begin in FY 1988. MCM Mine Countermeasures Ship—$18.4 million (including $9.6 million for outfitting, $8.5 million for post-delivery, and $0.3 million for contract design) is requested in FY 1987, with another $272.2 million (for three ships) projected for FY 1988 funding. A twinscrew geared-diesel ship approximately 200 feet in overall length and with an approximate beam of 37 feet, the MCM is designed to have accommodations for 80 personnel. Peterson Builders of Sturgeon Bay, Wis., and Marinette Marine of Marinette, Wis., are building MCMs previously funded. MSH-1 Coastal Minehunter—$ 206.1 million, including $8.5 million for outfitting and $1.5 million for contract design, is requested for four ships in FY 1987; another four ships will be funded in FY 1988 at a projected cost of $181.8 million. The minesweeper hunter "will be approximately 150 feet in length and displace 470 tons. It will carry a crew of about 40 personnel . . . and will be capable of coastal mineclearance operations of up to five days' duration without replenishment." Bell Aerospace Textron is building the lead ship; "17 ships of this class are planned, with the last eight ships being recompeted." Strategic Sealift: Ready Reserve Force (RRF)—$27.8 million is requesed in FY 1987, with an additional $50.4 million projected for FY 1988 and $39.1 million also requested in FY 1987/88 funding for "Strategic Sealift Enhancement." These funds are intended "To provide DOD with contingency shipping capacity which can upon request be activated for service during national emergencies and be made ready for sea through a time-phased program within five and ten days of notification." The ships expected to be used in the program will be "purchased from private owners and . ..
placed in the RRF" (a rapid-re- sponse "subset" of the National Defense Reserve Fleet, or NDRF). SSN-21 High-Speed Nuclear Attack Submarine New-Design Program—$712 million, including $1.0 million for contract design and $256.7 million for RDT&E, is requested in FY 1987; an additional $160.2 million is projected for FY 1988 funding, with construction of the lead ship in a very long-term program expected to be fully funded in FY 1989. The new design submarine, the Navy says, "will be about 350 feet long, and displace about 9,000 tons. These single-screw submarines will carry a crew of 133 and be equipped with MK 48 torpedoes, Harpoon and Tomahawk missiles, [and] other weapons [and will be] capable of long-endurance submerged patrols." SSN-688 Los Angeles-Class Nuclear Attack Submarine— $2,423.2 million (including $53.8 million for outfitting, $32.9 million for post-delivery costs, and $3.9 million for RDT&E) is requested in FY 1987 funding (for four ships), with another three ships projected for FY 1988 at a cost of $2,046.9 million. The LA-class SSN is 360 feet long and displaces 6,900 tons. It carries a crew of 102 and "is equipped with MK 48 torpedoes, [and] Harpoon and SUBROC [Submarine Rocket] missiles, and is capable of longendurance submerged patrols." Newport News Shipbuilding of Newport News, Va., and the Electric Boat Division, Groton, Conn., of General Dynamics are building SSN-688s previously funded. TACS Auxiliary Crane Ship—$63.5 million, including $2.4 million for post-delivery, is requested for FY 1987 for conversion of two ships for the RRF "by installing cranes to permit offload of general military cargo from all existing ship types where port facilities are inadequate or non-existent." Two more ships will be funded for conversion in the FY 1988 budget, at a cost of $59.9 million. The ships to be modified are "container ships to be selected by the Maritime Administration and Navy." TAGOS SURTASS Ocean Surveillance Ship—$151.7 million, including $2.7 million for outfitting and $0.9 million for postdelivery, is requested for construction of three ships with FY 1987 funds; an additional three ships (with greater capabilities) will be built for a projected $193.9 million in FY 1988 funds. A twin-screw, 11- knot, geared diesel with auxiliary electric motor, the TAGOS ships "will be approximately 224 feet long and 42 feet wide." Tacoma Boatbuilding, Tacoma, Wash., built the first 12 TAGOS ships funded (between FY 1979 and FY 1982); Halter Marine of New Orleans won the contract for the FY 1985 program. TAO Fleet Oiler—$292.6 million (including $2.4 million for outfitting, $13.8 million for post-delivery, $0.5 million for contract design, and $0.4 million for RDT&E) is requested for two ships in FY 1987; two more are to be procured in FY 1988 for a projected $319.9 million. A "commercialized" AO-177- class fleet oiler, the TAO has "a 20- knot speed capability and 180,000- barrel capacity," with accommodations for a 106-man Military Sealift Command crew, a Navy C3 (command, control, and communications) team of 21 men, and "10 transient personnel." Avondale Shipyard of New Orleans and Pennsylvania Shipbuilding of Chester, Pa., are building TAOS previously funded. AE Ammunition Ship—One ship is planned for FY 1988 procurement at a cost of $369.8 million; no additional information was provided in the DOD and Navy budget documents. SSBN Trident Ballistic Missile Submarine—$1,708.4 million (including $8.0 million for outfitting, $6.4 million for post-delivery, $51.8 million for RDT&E, and $133.1 million for military construction) is requested in the FY 1987 budget (for one submarine); $1,516.5 million will be requested in FY 1988 for another Trident. The Tridents, equipped with 24 longrange strategic ballistic missiles, are "designed to be highly survivable in a hostile antisubmarine warfare environment" and will have an estimated nine-year operating cycle between overhaul/refueling, "plus an operating life in excess of 20 years." Trident prime contractor is the Electric Boat Division (Groton, Conn.) of General Dynamics.